World No. 1 Gilbert will line up as the two-time defending champion against a field of challengers who hope to knock him off balance. The 'race of the falling leaves' marks the end of a long season. All season long, the peloton has been marking the wheel of Philippe Gilbert, but that hasn’t stopped him from scoring victory after another. The scenario will repeat itself in Saturday’s 105th Giro di Lombardia, where world No. 1 Gilbert will line up as the two-time defending champion against a field of challengers who hope to knock him off balance. Gilbert missed the winning move in Thursday’s Giro di Piemonte, a race he’d also won two times running, meaning that the Belgian will only be doubly motivated Saturday to put a finishing touch to his extraordinary 2011 campaign. Other big names include Damiano Cunego (Lampre-ISD), Ivan Basso and Vincenzo Nibali (Liquigas-Cannondale), Bauke Mollema (Rabobank) and Giovanni Visconti (Farnese Vini). Changes to the route mean victory will require a perfect mix of strength and tactics, something that Gilbert has not been lacking all year. Whether someone can match him mano-a-mano sets the stage for the season’s final big battle. 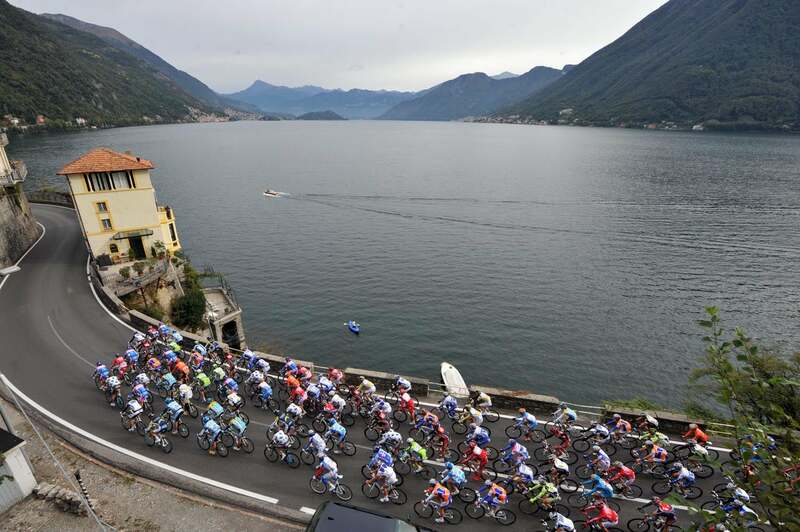 This year’s routes, 241km from Milano to Lecco on the shores of Lake Como, features some interesting changes. The emblematic Ghisallo climb remains eternal, but a new climb at the Villa Vergano (7km at max grades of 12 percent) some 9km from the finish line should provide a launching pad for aggressive tactics. The twisting descent off the Vergano, which bottoms out with 2.8km to go, could favor strong descenders such as Nibali and Samuel Sanchez (Euskaltel-Euskadi), though Gilbert is no slouch himself when the road heads downhill. 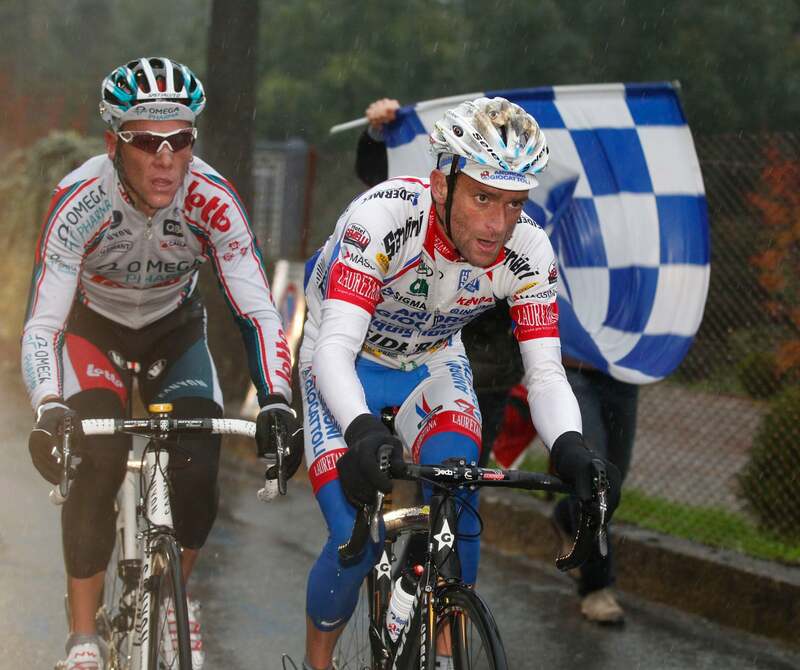 Michele Scarponi and Philippe Gilbert battle in last year's rainy edition of the Race of the Falling Leaves. The Italians love to romanticize cycling and affectionately call the race la classica delle foglie morte (Race of the Falling Leaves in English) and Lombardia deserves the distinction of one of cycling’s five monuments. It’s also been called the “worlds of autumn,” and the hilly, 241km race always produces racing pyrotechnics worthy of its long tradition. Another rider to watch is Cunego, a three-time winner who was testing his form during the Tour of Beijing last week. Cunego said he went to China to specifically race into form to make a run to join the four-win club. Fausto Coppi holds the record with five victories, meaning that the Little Prince could come within one race of history if he can pull off a big ride Saturday. Last year’s runner-up, Michele Scarponi, will not be starting for Lampre. Recently crowned world champion Mark Cavendish will be showing off his rainbow jersey in what will be the last major race for HTC-Highroad, which is folding at the end of this season. Fabian Cancelllara and Maxime Monfort headline Leopard-Trek, also racing in its final major race before merging with RadioShack for the 2012 season. Olympic champion Sánchez leads Euskaltel-Euskadi while Dani Moreno, hot off victory in Thursday’s Giro di Piemonte, leads Katusha, which also includes Filippo Pozzato and Joaquim Rodriguez. North Americans lining for the season finale include Matthew Busche (RadioShack), Tom Peterson and Peter Stetina (Garmin-Cervelo) and Caleb Fairly (HTC-Highroad). Racing continues this weekend with the GP des Nations time trial event on Sunday in France.